Posted on February 5th, 2019 by Richie Koch in Articles & News. 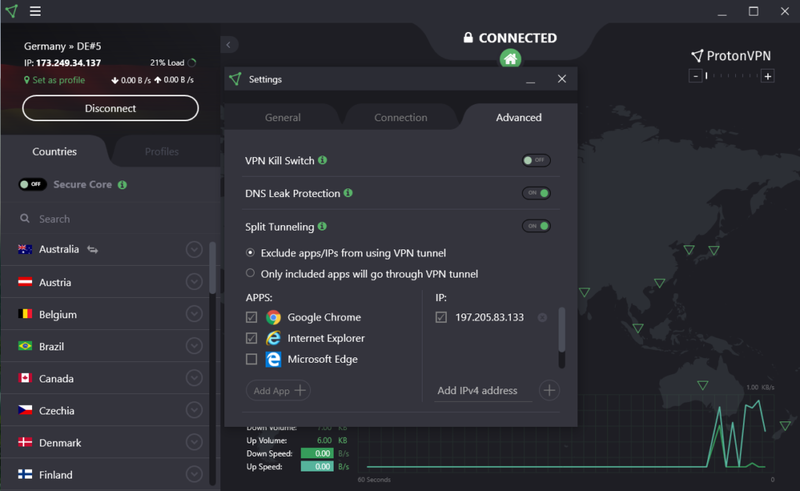 The newest version of ProtonVPN for Windows supports Split Tunneling, allowing you to decide which applications should use the VPN encrypted tunnel. There are also more profile options and OpenVPN ports. With Split Tunneling, you can protect your private data with VPN encryption and still access public networks at the same time. By activating Split Tunneling, we will route all of your Internet traffic through the encrypted VPN tunnel except for the apps and the destination IP addresses you select. By excluding non-sensitive data from VPN encryption, you will reduce latency and be able to access foreign and locally geo-blocked content at the same time. and then select the Advanced tab. Once you turn Split Tunneling on, you will be able to select which apps and IP addresses to exclude from the encrypted VPN tunnel. For more details, see our Support article. Inverse Split Tunneling is, as the name suggests, the opposite of Split Tunneling. Instead of selecting which apps and IP addresses to exclude from the blanket VPN encryption, Inverse Split Tunneling lets you choose which apps have their Internet traffic encrypted in the VPN tunnel. All other traffic will be excluded from the VPN tunnel. You can now write longer names for your Profiles (up to 25 characters), and select new options for profile colors. 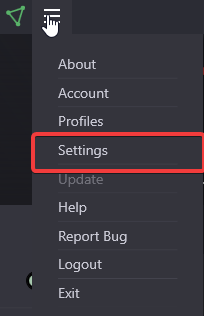 Profiles are also now saved to accounts rather than devices. This means that your saved profiles will be automatically accessible on other devices that run Windows when you sign in to the ProtonVPN app. Beginning with version 1.7, the Windows app will randomly select an OpenVPN port — and it has a greater selection of ports. Not only does this provide better load balancing (leading to better performance), it also offers better protection against VPN blocking. Now, if the first port selected is blocked, the app will automatically fall back to the next randomly selected port. 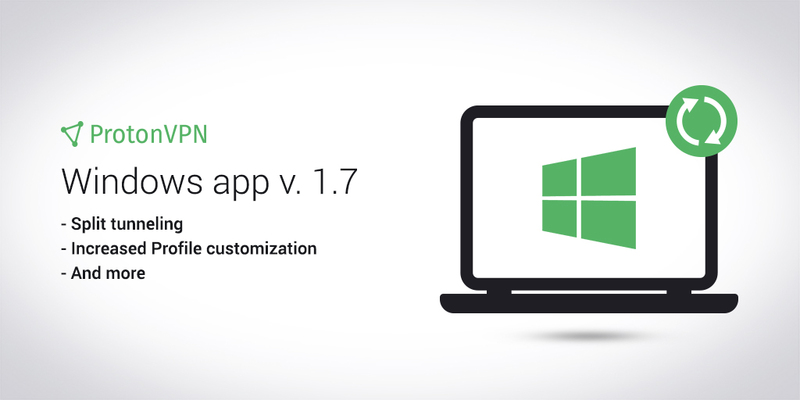 To download version 1.7 of our Windows app, click here. We’re excited about these new features in the latest version of ProtonVPN for Windows. Please join us on Facebook, Twitter, and Reddit, and let us know you what think! How about Split Tunneling for MacOS X? I’d love to have port-forwarding as a feature in general. Please consider it. Unfortunately, port-forwarding is not supported on ProtonVPN at this moment. We will consider adding this feature in the upcoming period, but we cannot give you any specific time-frame for that to happen. With this new version I can no longer connect to any services running on 127.0.0.1. This includes Protonmail Bridge listening on 127.0.0.1. I cannot connect to any local 127.0.0.1 SSH tunnels either. 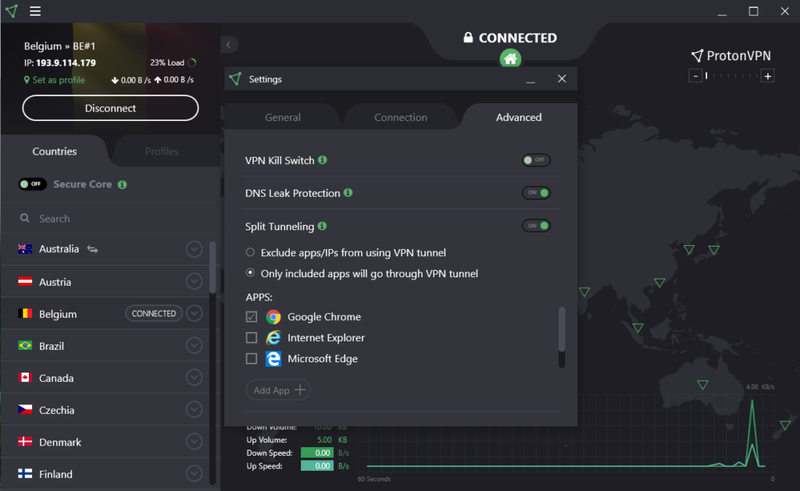 Disconnecting and existing the software is not enough, I have to kill the Protonvpn service process in task manager to restore connectivity to 127.0.0.1. It does not matter if I use an include or exclude model for split tunneling (even if I exclude 127.0.0.1), or have no splitting tunnel configuration at all, 127.0.0.1 remains inaccessible. Since I rely on Protonmail Bridge I’ve had to stop using Protonvpn. Anyone else seeing the same issue? We will need more details to detect what exactly is causing that behavior so please provide all of the applicable details by creating a ticket for our support team: https://protonvpn.com/support-form. We would be glad to help you out! Will you consider adding SSH/SSL Tunneling in order to better get around ISP blocking and throttling? Hello! This would require port-forwarding which we do not support at the moment, but we will consider it for our further developments. Richie, I would be very interested to hear ProtonVPN’s perspective on the advantages of using the VPN as it relates to new threats posed by 5G technology. Have a great day. Hello! That’s a great suggestion, thank you! It will be passed on to our team. 1. Are there any plans to allow two separate tunnels to different VPN servers on a per-application basis? 2. Is there a way to do the above on Linux with some OpenVPN magic? Hello, thank you for your comment! At the moment, we do not have any plans but we will consider implementing this feature in the future. Regarding your second question, unfortunately, that is not possible. Can’t wait for the Linux version !